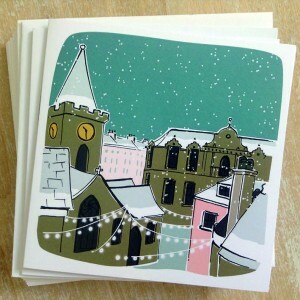 The Society has commissioned Caroline Cummins of Little Paper Gallery (based in Guernsey) to produce a set of distinctive Guernsey Society Christmas Cards. There are two different designs (as shown) – one of the Town Church and the other of the Lighthouse with Castle Cornet in the background. Price is £7 .00 for a pack of 10 cards – each pack containing five cards of each design. If you would like to buy packs to send to family and friends this Christmas, please place your order and payment by Paypal before the end of September, using the Buy Now button below. A limited number will be on sale at our November meeting in London.